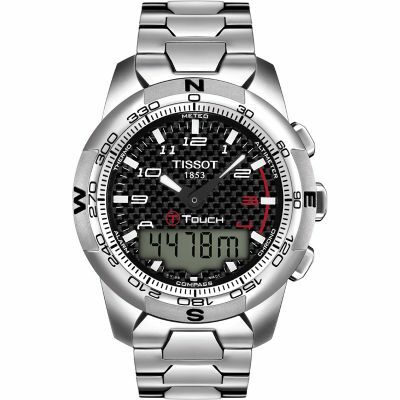 Chunky mens Tissot T-Touch II watch in titanium, set around a black dial with day, date and month functions, chronograph, dual time, alarm and luminescent hands. A stylish watch with high tech functions. 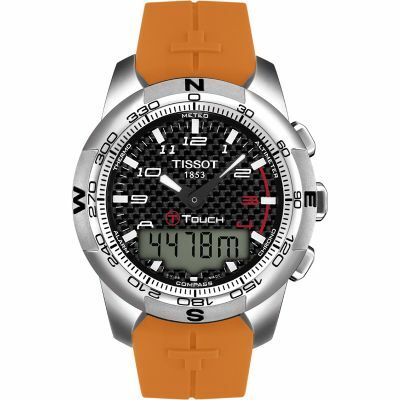 I wanted one tough enough for swimming and daily life but stylish enough for meetings and socialising.The titanium case is an attractive , silver colour, a good manly size but not too heavy. Combined with the rubber strap, it is water resistant enough for a daily swim. I chose this above others, as it has an alarm which many didnt. It has several other functions, all accessed by the touch sensitive screen. It was a gift and the recipient is delighted with it. Really pleased with the T-Touch was amazed how light it is. The rubber strap is very comfortable and I was able to adjust it myself with a sharp knife. The touch screen functions are impressive and this watch will certainly get a lot of attention from others. All in all very happy with the product, I had been looking at the Touch for sometime before settling on this one and I have not been disappointed. Been after T-Touch since I first saw the range and have to say it hasn't disappointed since I bought it.